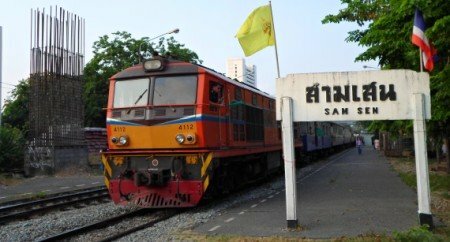 Samsen Railway Station is a small train station in Bangkok city. 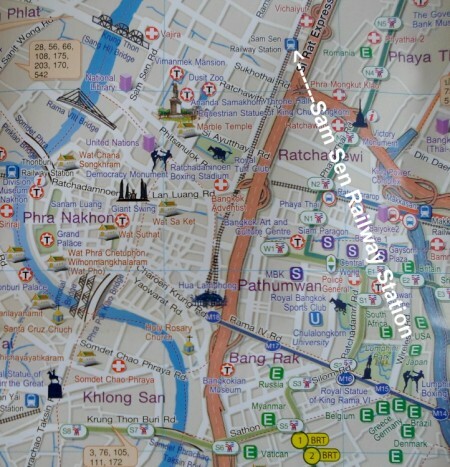 The station is located in between Hualamphong station (to the South) and Bang Sue Junction station (to the North). Be careful: the station is not on Sam Sen Road or at a walking distance from this area of the city that is popular with tourists for its guest-houses and hotels in Pranakorn District. 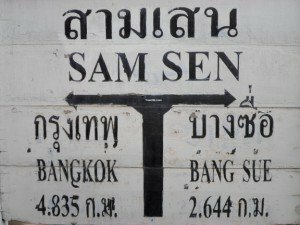 Sam Sen station is actually located along Thoet Damri Road (ถนนเทอดดำริ) and Kamphaeng Phet 5 Road (ถนนกำแพงเพชร๕) near Set Siri intersection (แยกเศรษฐศิริ) in the Phaya Thai district (เขตพญาไท). 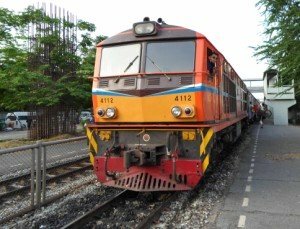 Depending on where you are staying in Bangkok, it may be easier and quicker for you to get to this train station to catch your train out of the city, rather than going to Hua Lamphong or Bang Sue, as nearly all departures from Hua Lamphong stop here. This is also true for passengers heading into the city as it may be closer to your final destination (depending on where you are planning to stay in the city). 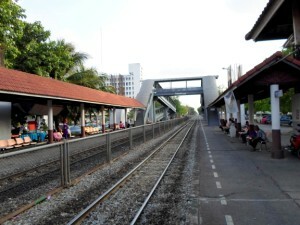 The station is served by the trains running on Thailand's Northern, North-Eastern and Southern railway lines. - Platform 1 is for trains leaving from Bangkok. 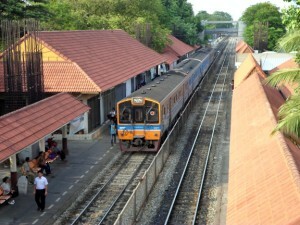 - Platform 2 is for trains heading for Bangkok. Two footbridges located on both ends of the platforms allow people to cross from one side to the other. 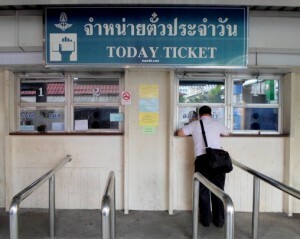 To buy your tickets : there are ticket selling counters and a luggage / cargo office on Platform 1 near Thoet Damri Road. 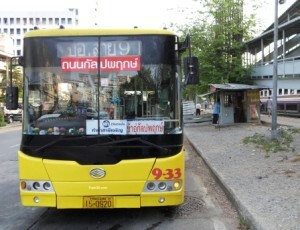 - the bus 9 which connects the railway station to places near Khaosan Road such as Ratchadamnoen Avenue (ถนนราชดำเนิน), Sanam Luang (สนามหลวง), the Grand Palace, Phra Athit Road (ถนนพระอาทิตย์) and Sam Sen Road (ถนนสามเสน). If you are coming from Khaosan Road you can board this bus on Phra Athit Road or on Samsen Road at the bus stop near the entrance of Soi 1. 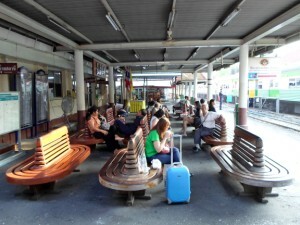 - the bus 125 which connects the train station to Sai Tai Mai (Southern Bus Terminal) and Salaya. The closest BTS (Sky Train) Station is the BTS Station Ari (อารีย์). 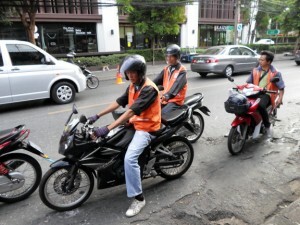 It can be reached by taking one of the motorbike taxis parked near the railway station (Fare = 35 THB). 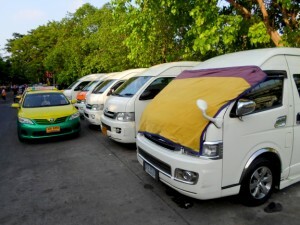 There is a minibus / van service by the train station on Kamphaeng Phet 5 Road for Pak Thong Chai (ปักธงชัย) in Nakhon Ratchasima Province (นครราชสีมา). 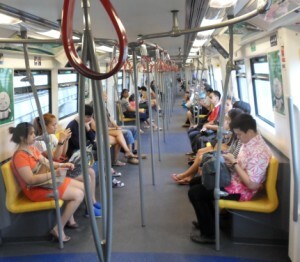 The service runs from 6.00 to 19.30 and costs 200 THB.